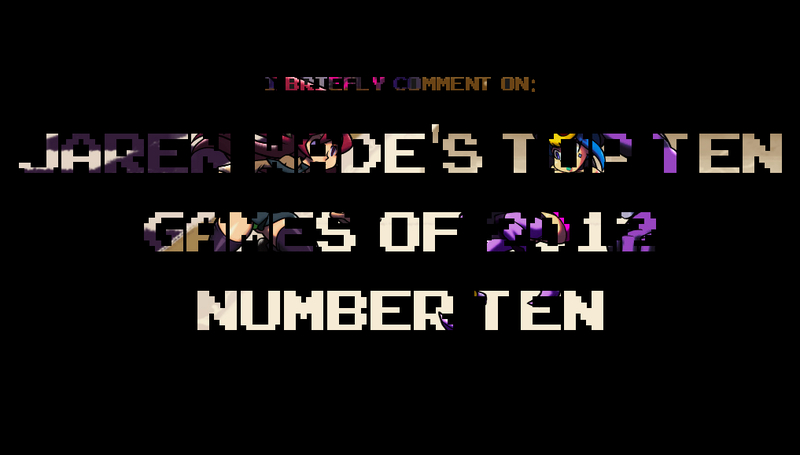 Let's make an arbitrary list of my favourite games of 2012. Here's number ten. 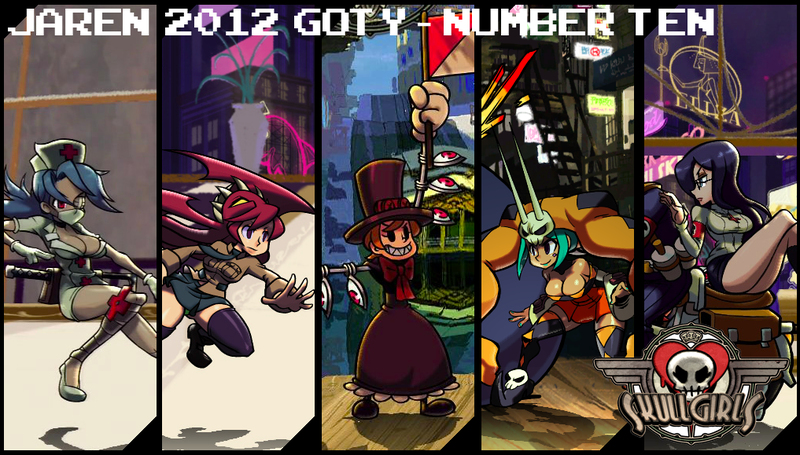 On paper Skullgirls sounds like blatant fan service. It’s a fighting game that features an all female cast. An all female cast that features a school girl, a nurse, a circus performer whose breasts stick out and a mini-skirt wearing princess - underwear shots included. While it would be easy to write the game off at a glance, the dedication and passion of project lead Mike Zaimont and developers Reverge Labs can definitely be seen after getting your hands on the actual product. Once you get passed the whole “all girl fighting game”, you’re introduced to gorgeous looking sprite based character models, with lively backdrops to match. Accompanying the visuals is a tight six button fighting system, giving players the ability to perform combos, super moves, special moves, character tag-ins and the standard light, medium and heavy attacks. Throw in a soundtrack composted by Michiru Yamane, and you have an overall solid package. 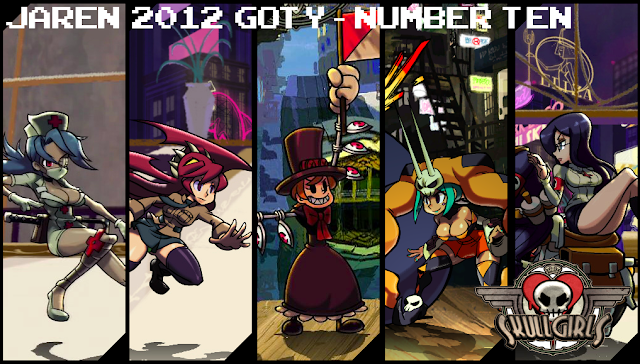 It was pitched as a fighting game developed by fighting game enthusiasts, and it shows. One of my favourite aspects of the game was how it handled team building. Players are able to choose a single character, or a team of two or three. The less characters you pick, the stronger they become. This provides the ability to not only have strong one-on-one matches, but hectic 3-on-3 battles as seen in the VS. Series games as well. 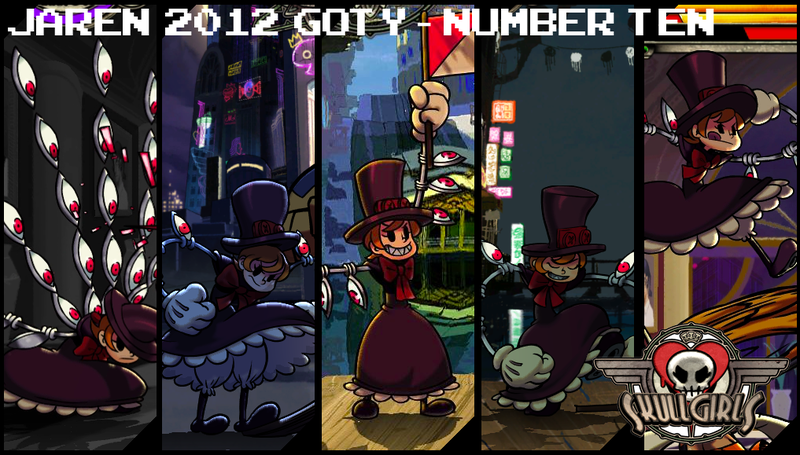 It was the tutorial however that solidified a place for Skullgirls in my heart. I’m far from what you would call an expert in fighting games. While I do enjoy the genre, there’s something about it that I’m unable to wrap my brain around. No matter how long I spend lurking Shoryuken wiki pages, I cannot understand the different techniques, strategies and mechanics that go into mastering a fighting game. With Skullgirls’ tutorial, I actually began to. Unlike other fighting game tutorials that essentially tell you how to perform certain moves, the game actually explained when I should execute then. As I progressed through its many lessons, I began to learn about mix ups and hit confirmations, different mechanics that I had previously heard from fighting game stream commentators but had no idea their meaning. I found myself replaying tutorials until I fully understood its concepts and from there I was able to enjoy a fighting game on a level that I hadn’t been able to previously. Not only did it make me appreciate the game a lot more, but made playing it even more satisfying. Plus it introduced me to Peacock, one of my favourite characters of the year. That has to be worth something. Speaking of which, here's a creepy alternative title card.